Heather Paunet is one of the ladies that has worked in the tech industry for a long time, climbing up the ladder and amassing important knowledge on how to stay safe online and what it means to be a woman in a male-centric industry. 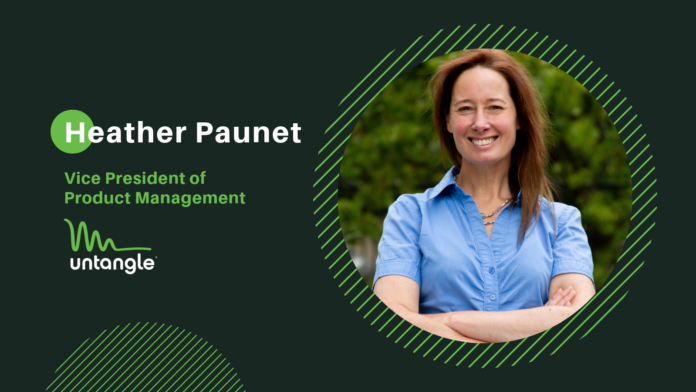 Paunet is, nowadays, the Vice President of Product Management at Untangle, a company that provides comprehensive network security for small and midsize businesses. Previously, she was VP of product at GFI Software, VP of Product & Design at Kerio Technologies, and went through various jobs over at Cisco Systems. In an interview with TechNadu, Heather Paunet discusses Untangle’s work, staying safe online, the biggest threats we have and gives advice to other ladies who may be intimidated by the tech industry. TechNadu: First, give us a few details about the products Untangle has on the market, striving to help secure networks better. What’s your product’s forte? Heather Paunet: Untangle has a suite of products that are designed to collectively keep a company’s systems and data safe and secure. NG Firewall is our flagship product that provides a simplified approach to network security, offering customers a variety of applications to choose from depending on their network needs and budgets. We provide protection, visibility, and control for our customers over their network, at their network edge, or in the cloud for cloud-deployed business applications. We focus on building products for small-to-medium businesses. We make our products so easy to use that organizations with limited expertise can still get up and running quickly and easily with a comprehensive, cost-effective network security solution. Our products are also designed so that they can be remotely monitored and managed. With real-time alerts and cloud-based management tools accessible from anywhere with any device, administrators can always take action whether or not they are onsite. TechNadu: You offer solutions for a wide range of industries. Where do most of your clients come from and what seem to be their biggest problems that had them seek you out? Heather Paunet: Untangle serves the below-enterprise market across all industries. One area where we do particularly well is in the educational vertical. Students are vulnerable to both inappropriate and malicious content when accessing the internet. Schools and universities need to be able to protect students from accessing harmful content on the internet which could render a student device or the school network inoperative. Untangle NG Firewall can be easily configured to meet the specific acceptable use policies of a given institution, safeguarding networked devices from threats. It’s so easy to access information when doing schoolwork that it’s easy for students to become distracted. Without realizing it, students can while away the hours playing games or reading online content. Untangle NG Firewall can enforce rules so that leisure activities such as YouTube and Facebook are only available outside of regular school hours. Schools may also need to maintain compliance with certain standards in order to receive funding or continue operation. Untangle makes it easy to report on all network activities and show compliance through detailed reports. TechNadu: You’ve worked in the cybersec world for a long time now. How have things changed in the past few years? What are some good things and some bad things you’ve seen happen? Heather Paunet: People are now almost always connected to the internet. It used to be that we had an internet connection at work and at home as well. Now we have an almost ‘always-on’ service with open Wi-Fi and 4G available in many public places. This is a good thing, in that we, as people, have information at our fingertips at any moment, and we’re connected to useful services and to other people all the time. This is a bad thing because the advantages that this brings come with a larger attack surface than was available before for hackers to exploit. Cyber attacks make the news more regularly now which has raised awareness of how important it is to protect a business’s network. This is a good thing, as awareness leads to businesses making it a part of their IT strategy to put security measures in place. This is a bad thing, as cybersecurity attacks are becoming ever more complex and sophisticated, which make businesses all the more vulnerable. Information being sent over the internet is becoming more frequently encrypted. This is a good thing, as it’s easier to keep the information flowing across the internet private and hide sensitive data that is transmitted in messages or through web page interactions. This is a bad thing, as it’s also easier for hackers to hide the malicious activity that they are trying to do damage with, so it is harder to detect and block these types of activities. TechNadu: What do you believe is the biggest threat to people’s security nowadays? Are we still on ransomware, or have we evolved beyond it? Heather Paunet: Ransomware is still one of the biggest threats. The ransomware itself is still evolving. Attacks are becoming more sophisticated and done with more stealth than ever before, and, when successful, these attacks are still having devastating effects. While ransomware as a type of attack is still one of the biggest threats, I believe that people having their devices accessed and their personal information stolen when using public networks is one of the biggest risks. Additionally, businesses or homes having their networks compromised due to IoT devices being wide open, with regards to security, is a significant threat. TechNadu: The IoT industry is notorious for the bad security surrounding their devices. Do you think we need government-imposed regulations to set things straight or will companies eventually straighten themselves out? Heather Paunet: We’re in a time where we are starting to take for granted that a ‘thing’, such as a thermostat, a fridge or even a door needs a network connection. We’re getting exceptional benefits from that, in that we have an always-on, seamless connection between people and information. A lot of innovation is coming out of this where new products and services are being made available that we couldn’t have dreamed possible just a few years ago. While I’m not sure we need government-imposed regulations, I do see the need for well-documented guidelines as to how a well-built IoT device should protect itself and the network it runs on. We’ve seen examples that have made the news including intelligent dolls being hacked so that access could be gained into home networks, and thermostats being hacked, locked and held for ransom. Generally, IoT devices are always on and are always connected to the cloud. The only sure defense is IoT built-in-security. However, vendors making new innovative products are not always aware and don’t always know how to protect the IoT devices that they are building. Guidelines would be very beneficial to ensure that IoT vendors know what security protocols they need to include, and purchasers have a point of reference regarding security for IoT devices they consider buying. TechNadu: Talking of which, do you have any IoT devices yourself? If yes, are there steps you take to keep your privacy and protect your data? Heather Paunet: Yes, I have various IoT devices in my own home. I have speakers, smart TV’s, multiple smart plugs and various virtual assistants. The steps I take to protect my own home network are very simple but collectively very effective. My home network is protected using our Untangle NG Firewall with Virus Blocker and Web Filter and all my IoT devices are connected to a network that is separate from the main network that I use for laptops and mobile phones. There is a separate network for guests and visitors. Wi-Fi network names are not publicly broadcast so that no one can see my networks in order to try and connect to them. Plus, I use the strongest Wi-Fi encryption on my home network. TechNadu: Many voices in the industry say that people should use VPNs on a daily basis to keep their data safer. How do you stand on this? Do you use a VPN yourself? Heather Paunet: Compared to a few years ago, it’s incredible how easy it is to get online anywhere now. From better 3G/4G data connections on our mobile phones to the number of Wi-Fi networks that we see available in many public places now, we can be online almost all the time. While our lives have become easier due to this always-on access, the threat surface has also expanded. I do recommend using a VPN when connecting to the internet from a public Wi-Fi network. As long as there are trusted Next Generation Firewall technology in place on a work or home network, I consider myself safe. On any other type of network, I would and do always use VPN technology that I trust. TechNadu: The tech industry isn’t exactly known for welcoming women with open arms, especially since girls are often discouraged to take this path even in their school years. What advice do you have for young girls who may want to build a career for themselves in tech? Heather Paunet: My own experience with women in the tech industry is that I’ve had some great mentors that were women who stood head to head with their male counterparts without appearing to think twice about it. When anyone, whether they are male or female, is interested in something and they work hard at it, they can be successful. Technology is fascinating and being part of a cutting-edge business that is building something that makes people’s lives better is very satisfying. For any girls who are considering a career path in tech, I would ask them to ignore anything that is in their path that discourages them. I’m finding now that there are more women in tech than ever, and they will find themselves in good company with other like-minded women. So, what do you think of what Heather has said? Are there any points you don’t agree with? Anything you’ll take on and apply to your own life? Let us know in the comments section below. Please share the interview online so others can find it too. Follow TechNadu on our socials – Facebook and Twitter – for more interviews, tech news, guides, and reviews.